TELUS Corporation’s TU subsidiary — TELUS Health — recently announced that it has partnered with Babylon, a leading digital health company operating worldwide, to provide doctors and patients access to virtual healthcare technology services in Canada. Together, they intend to support continuity of care by delivering more options to Canadians for accessing quality healthcare and communicating more efficiently. Per a recent study by the Canadian Medical Association, three out of four Canadians believe that new technologies could solve their issues in healthcare system and seven in 10 would take advantage of virtual physician visits. Through this partnership, the new healthcare services will join the existing facilities across the country for people living in rural areas or with mobility issues, and for the 5 million Canadians who do not have a family physician. TELUS Health seeks to upgrade the power of technology to deliver better health outcomes for Canadians to lead healthier and happier lives. The company’s partnership with Babylon will enable consumers to get access to healthcare facilities anywhere and anytime. This will not only help to improve the options Canadians have for accessing healthcare but also provide them with a digital tool that makes communicating with healthcare professionals more efficient. Notably, Babylon’s suite of digital solutions is being used by around 3 million direct members outside Canada and is accessible to millions through its worldwide partnerships. The virtual care technology will be available in Canada through a version of the mobile app developed specifically for the country. The app, powered by artificial intelligence, includes an easy-to-use, chat-style symptom checker that patients can use to better understand their symptoms and healthcare concerns. It can also be used to have a video consultation with a licensed Canadian healthcare provider. The service will be made available in English at launch with French being added in 2019. 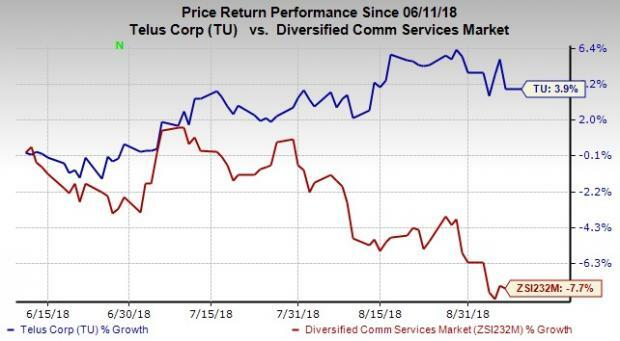 In the past three months, shares of TELUS have gained 3.9% against decline of 7.7% for the industry. TELUS currently has a Zacks Rank #3 (Hold). Better-ranked stocks in the industry include Shenandoah Telecommunications Co. SHEN, Swisscom AG SCMWY and Vivendi SA VIVHY, each carrying a Zacks Rank #2 (Buy). You can see the complete list of today’s Zacks #1 Rank (Strong Buy) stocks here. Shenandoah surpassed earnings estimates thrice in the trailing four quarters with an average positive surprise of 260%. Swisscom has a long-term earnings growth expectation of 2.4%. Vivendi has a long-term earnings growth expectation of 14.3%.